The first attempt at an international organization to reconcile the differences and harmonize actions among nation-states was the League of Nations. The governments of the United States, the Soviet Union, the United Kingdom, and China formalized the Atlantic Charter proposals in January 1942 with the signing of the Declaration of the United Nations. 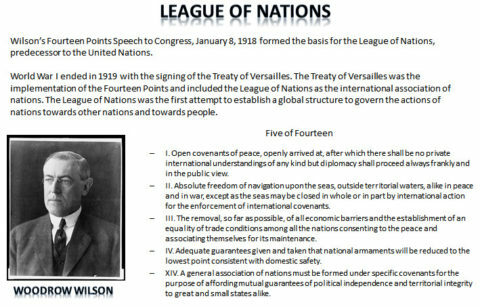 The basic framework for the proposed United Nations rested on President Roosevelt’s vision that the United States, the Soviet Union, the United Kingdom, and China would provide leadership in the postwar international system. It was these four states, with the addition of France, that would assume permanent seats in the United Nations Security Council. On April 25, 1945 a conference was held in San Francisco to finalize some of the details and to vote on the Charter to establish the United Nations. The conference approved the creation of an Economic and Social Council and a Trusteeship Council to assist in the process of decolonization, and agreed that these councils would have rotating geographic representation. 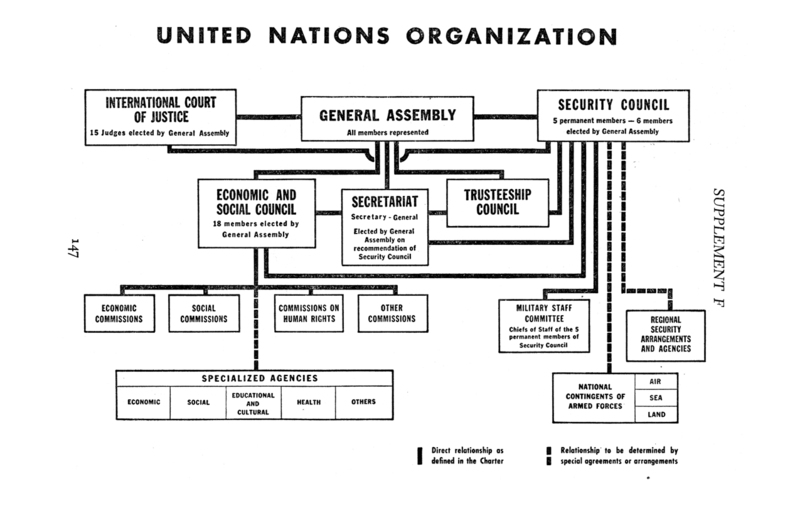 The United Nations Charter also gave the United Nations broader jurisdiction over issues that were “essentially within” the domestic jurisdiction of states, such as human rights, than the League of Nations had, and broadened its scope on economic and technological issues. Nelson Rockefeller attended the United Nations conference in San Francisco. According to his biography posted on the Senate website, Rockefeller played a key role in hemispheric policy developing a consensus for regional pacts (such as NAFTA) within the UN’s framework. On July 28, 1945, the U.S. Senate voted to ratify the UN Charter. December 20, 1945, the U.S. Congress voted to approve the United Nations Participation Act. “Kennan and his new State Department Policy Planning Staff produced one of the master documents from which the Marshall Plan eventually flowed…. but there was a specifically European dimension to the Marshall effort. Europe’s evil genie, said people like Kennan, Assistant Secretary of State Dean Acheson, and future ERP Ambassador Averell Harriman, was nationalism. If that root of Nazi-fascism and other 20th-century rivalries could be bottled up in an integrated European economic framework, the resulting prosperity might dampen nationalist competition, prevent future armed conflicts, and obviate U.S. involvement in future European wars. A declassified State Department report on the Department’s position on the European Recovery Plan (ERP) gave the objective of using bilateral and multilateral trade agreements to eventually form a European Customs Union (regional pact). • Essential Elements. Concrete proposals for area-wide recovery of agriculture and basic industries — coal, steel, transport, and power — which are fundamental to viable European economy. • Progressive replacement of bilateral trading arrangements by more effective multilateral arrangements for expanding intra-European trade, looking if possible, toward an eventual European Customs Union. • “While in many respects the long-run gains of European economic integration in terms of specialization of production and economic location — achieved ideally through both a customs and a currency union — would be the most beneficial consequences of a recovery program, these goals must be put in perspective in relation to more urgent short-run needs. • Role of the UN. “Department supports fullest practicable use of United Nations bodies and specialized agencies in carrying out of program. This includes continued international allocation of coal through ECE Coal Committee and food through IEFC Committees, and technical planning work in ECE Committees on transport and power. Sympathetic to assignment to ECE of additional functions related to program. But Dept recognizes that coordination of European program and integration of UN activities with needs of this special program will probably have to be retained in organization composed only of participants (including bizonal Germany). In view possibilities systematic obstruction to ECE effectiveness, special European recovery organization must be able to handle entire program and must be prepared to assume promptly functions assigned to other organizations if they prove ineffective. • Continuing Organization. Dept recognizes that present Conference cannot possibly make complete blueprint for European recovery over next several years. Initial program must conform to all above elements, but many details of its application will remain for further study. Modifications are also to be expected during negotiations with the U.S. before acceptance and in continuing development of any accepted program. Emphasis should be given to major role of continuing organization of participating countries (plus bizonal German area), both in implementing and in progressively refining any agreed program. On June 5, 1947, General George C. Marshall gave a speech at Harvard University to announce the Marshall Plan (Economic Recovery Plan) for Europe. Sec. 102 (a) Recognizing the intimate economic and other relationships between the United States and the nations of Europe, and recognizing that disruption following in the wake of war is not contained by national frontiers, the Congress finds that the existing situation in Europe endangers the establishment of a lasting peace, the general welfare and national interest of the United States, and the attainment of the objectives of the United Nations. SEC. 104. (a) There is hereby established, with its principal office in the District of Columbia, an agency of the Government which shall be known as the Economic Cooperation Administration, hereinafter referred to as the Administration. (2) recommend the appointment or assignment of persons, and the Secretary of State may appoint or assign such persons, to any class in the Foreign Service Reserve or Staff for the duration of operations under this title, and the Secretary of State may assign, transfer, or promote such persons upon the recommendation of the Administrator. (c) No citizen or resident of the United States may be employed, or if already employed, may be assigned to duties by the Secretary of State or the Administrator under this title for a period to exceed three months unless such individual has been investigated as to loyalty and security by the Federal Bureau of Investigation and a report thereon has been made to the Secretary of State. and the Administrator, and until the Secretary of State or the Administrator has certified in writing (and filed copies thereof with the Senate Committee on Foreign Relations and the House Committee on Foreign Affairs) that, after full consideration of such report, he believes such individual is loyal to the United States, its Constitution, and form of government, and is not now and has never been a member of any organization advocating contrary views. The economic assistance to European nations was authorized for a period of four years. Paul G. Hoffman, CEO of the Studebaker automobile company was appointed to lead the Economic Cooperation Administration (ECA). The European counterpart to the ECA was the Organisation for European Economic Co-operation (OEEC). The purpose of the ECA for public information was that the recovery plan had four objectives. The subversive agenda of the European Recovery Plan was hidden behind the National Security Curtain created by the National Security Act of 1947. A National Security Council will be established, the membership of which will be the President, the Secretary of State, the Secretary of Defense, the Secretary of the Army, the Secretary of the Navy; the Secretary of the Air Force, the chairman of the National Security Resources Board, the Chairman of the Munitions, chairman of the Research and Development. The President will preside over meetings. The function of the Council shall be to advise the President with respect to the integration of domestic, foreign, and military policies relating to the national security so as to enable the military services and the other departments and agencies of the Government to cooperate more effectively in matters involving the national security. Under the National Security Council, a Central Intelligence Agency is established to coordinate intelligence activities of it’s own intelligence, intelligence from several other government departments and agencies in the interest of national security. Their purpose was to collect intelligence information and to evaluate, coordinate and disseminate intelligence information pertaining to national security. The Director of the CIA was responsible to protect intelligence sources and methods from unauthorized disclosure. They were also to provide services for the benefit of existing intelligence agencies such additional services, of common concern as the National Security council may direct from time to time. The function of the National Security Resources Board was to provide for the coordination of military, industrial and civilian mobilization in the event of war. They were to provide for the effective use in time of war, the nation’s natural and industrial resources to meet military and civilian needs for the maintenance and stabilization of the civilian economy in time of war. Coordination of the activities of the federal agencies and departments of government; planning for manpower, resources and production facilities in time of war and policies to ensure adequate reserves of strategic and critical material for continuous operation which is essential for the nation’s security. This act provided for the establishment of the position of Secretary of Defense to oversee the National Military Establishment. Chief of Staff, United States Army; the Chief of Naval Operations; and the Chief of Staff, United States Air Force. The War Council was to advise the Secretary of Defense on matters of broad policy relating to the armed forces, and shall consider and report on such other matters as the Secretary of Defense may direct. The Joint Chiefs of Staff were established within the National Military Establishment. It was composed of a Chairman, the Chief of Staff of the Army, Chief of Naval Operations; the Chief of Staff, United States Air Force; and the Chief of Staff to the Commander in Chief, if there be one. The purpose was to prepare strategic plans and to provide for the strategic direction of the military forces; to prepare joint logistic plans and assignments to military services as it pertains to logistic responsibilities in accordance with plans. It was to establish unified commands in strategic areas when such unified commands were in the interest of national security and to provides services to the military branches such as joint training, policies for education, and to review major material and personnel requirements of the military forces in accordance with strategic and logistic plans. Most importantly, the Chairman of the Joint Chiefs of Staff was to provide U.S. representation on the Military Staff Committee of the United Nations Security Council in accordance with the provisions of the Charter of the United Nations. Within the National Military Establishment, a Research and Development Board was established for the purpose of advising the Secretary of Defense on issues of scientific research as it pertains to national security and to prepare a complete and integrated program of research and development for military purposes; to advise him with the trends in scientific research and to assure continued and increasing progress; to recommend measures of coordination of research and development among military departments; to formulate policy in connection with research and development involving agencies outside the military establishment; to consider the interaction of research and development and strategy and to advise the Joint Chiefs of Staff. Provided for the Secretary of Defense to be third in line for the succession to the presidency in the event of death or disability of the President and Vice President. In 1949, the National Security Act of 1947 was amended to remove the Secretaries of the Military Branches from the National Security Council. 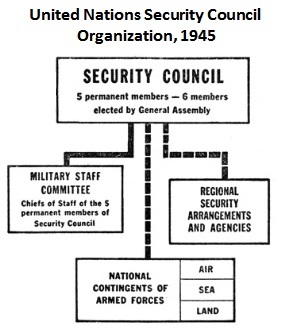 In 1949, the NSC was reorganized. 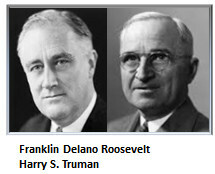 Truman directed the Secretary of the Treasury to attend all meetings and Congress amended the National Security Act of 1947 to eliminate the three service secretaries from Council membership and add the Vice President(who assumed second rank from the Secretary of State(and the Joint Chiefs of Staff who became permanent advisers to the Council. NSC standing committees were created to deal with sensitive issues such as internal security. The NSC staff consisted of three groups: the Executive Secretary and his staff who managed the paper flow; a staff, made up of personnel on detail, whose role was to develop studies and policy recommendations (headed by the Coordinator from the Department of State); and the Consultants to the Executive Secretary who acted as chief policy and operational planners for each department or agency represented on the NSC. 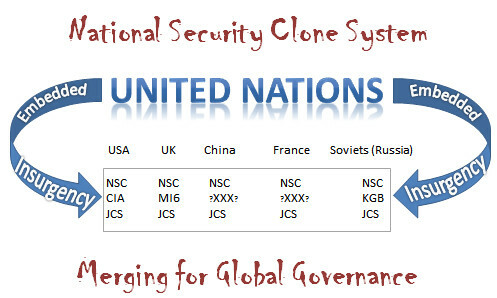 The conclusion drawn by this writer is that the national security apparatus established to coordinate policies with corresponding national security organizations in the other five permanent member states to the United Nations System was intended to direct U.S. policy for the merger of the American system of government into the global governance system of the United Nations. It was treason but because it was done in secrecy, the American people have been unaware of it and they moved slowly enough as to not be perceptible until following September 11, 2001.